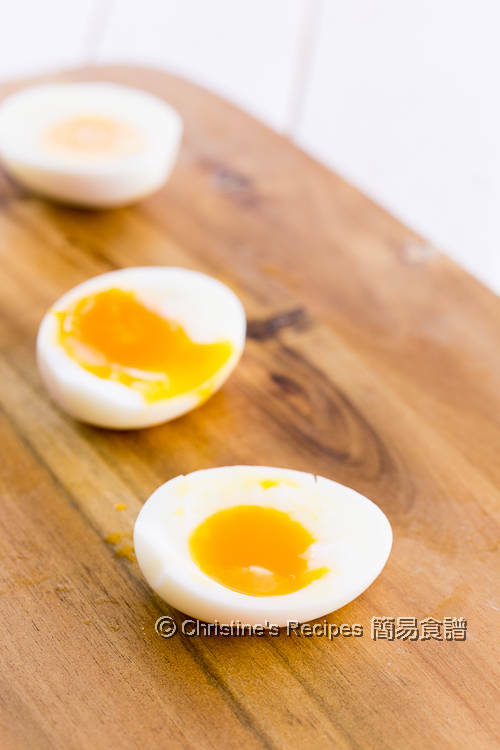 Soft-boiled eggs with yolks a bit runny are very charming for many foodies like me. I know, I know, some people like hard-boiled eggs instead. Sometimes I like to have a soft-boiled eggs for breakfast or go with a bowl of hot noodle soup. The eggs take the whole bowl of noodle soup up a level, appealing to eyes and taste buds. I used to cook eggs in boiling water. This method is good but quite tricky. The egg shells will easily crack in the boiling water. If using this steaming method, you’ll have peace in mind. The eggs won’t easily bump together and get cracked. It's very easy to peel the egg shells as well. Yet, I tested with chilled eggs. Chilled eggs straight from fridge will crack easily. So bear in mind, use eggs at room temperature. 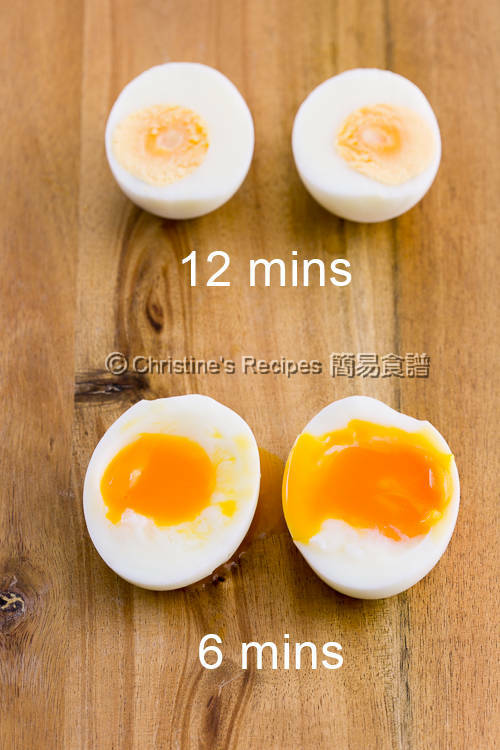 The next thing is that accurate cooking time determines your success in getting your favourite soft-boiled eggs. That’s it. You’re good to go. 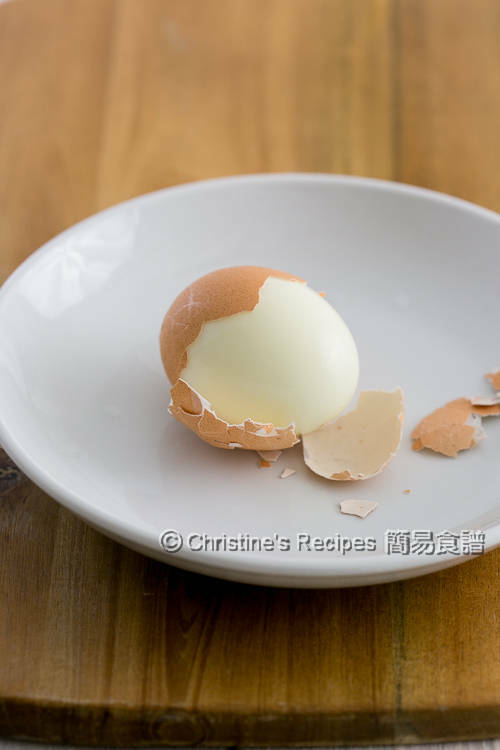 So those people who like hard-boiled eggs can use this simple steaming method too. Put water in a wok or a pot, about 2.5-cm / 1-inch in depth. Cover and bring it to a boil over high medium heat. You should see some steam releasing from the wok rim. Quickly remove the lid and carefully place eggs on a steaming rack. Cover and steam for 6 minutes. 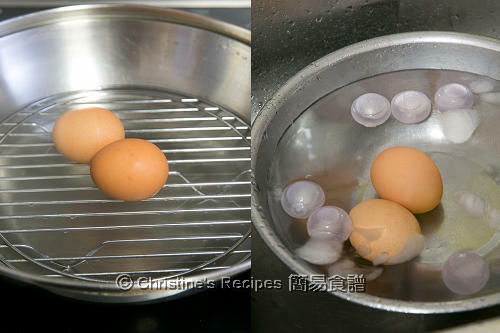 Transfer the eggs into a bowl of iced water. Let them cool to touch. Peel and cut open. The yolk will be runny. If the eggs are cooked for 12 minutes, they are completely cooked and the yolks are quite hard. If cooking for 10 minutes, the egg whites and yolks are cooked, yet the yolks are soft and not tough. So choose whatever you like to cook your own eggs somewhere between 6 to 10 minutes to get soft-boiled eggs. The eggs I used weighted 67 grams each with shells. They are large eggs in size. The cooking time varies depending on the size of the eggs you use. Please adjust and experiment accordingly. You’ll have confidence in achieving your own favourite soft-boiled eggs once you’ve done two times. If your eggs are chilled in fridge, let them rest in room temperature for 20 minutes. Have never tried the steamed version...how interesting! Must give it a try some time. You should try steaming eggs, Angie. It's very convenient too.